I am a local Singaporean student and I wish to complain about my teacher. Although teaching may seem like a noble profession involving numerous personal sacrifices, some teachers apparently have questionable attitudes which appear quite befuddling. 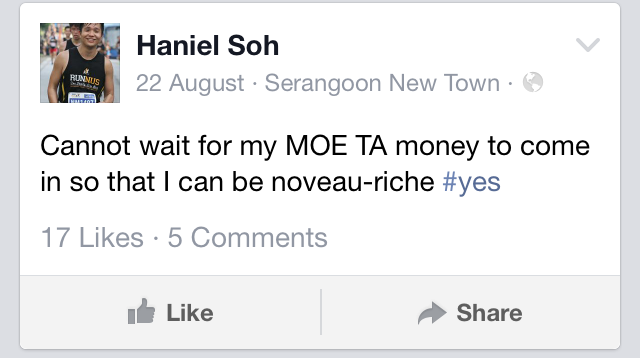 Broadrick Secondary School trainee teacher Mr Haniel Soh is one such example. Take for instance this particular situation where Mr Soh’s tutee did not do his homework. 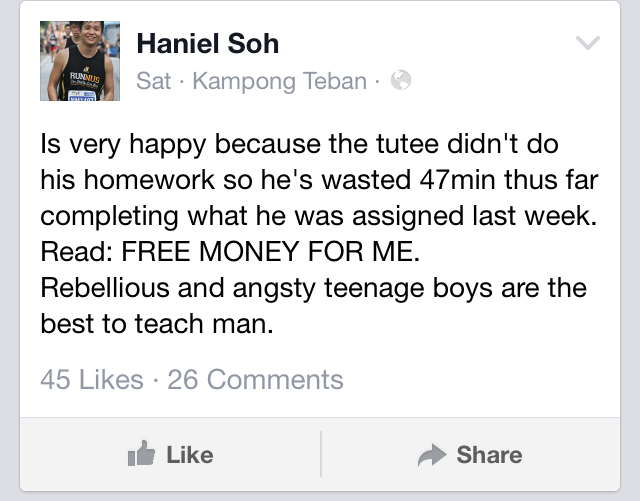 Instead of showing concern for this poor attitude, Mr. Soh took to social media to comment that he was “very happy” as a result of being able to make the tutee do his homework using tuition time thereby earning him ‘free’ money. If such an example wasn't bad enough, Mr. Soh’s professionalism is also questionable as he went on to publicly badmouth another of his students who apparently has a case of body odour. Even though $45 an hour is quite a decent sum for most undergraduates, Mr. Soh seems to make a mockery of this amount, asking if it is worth the “pain”. 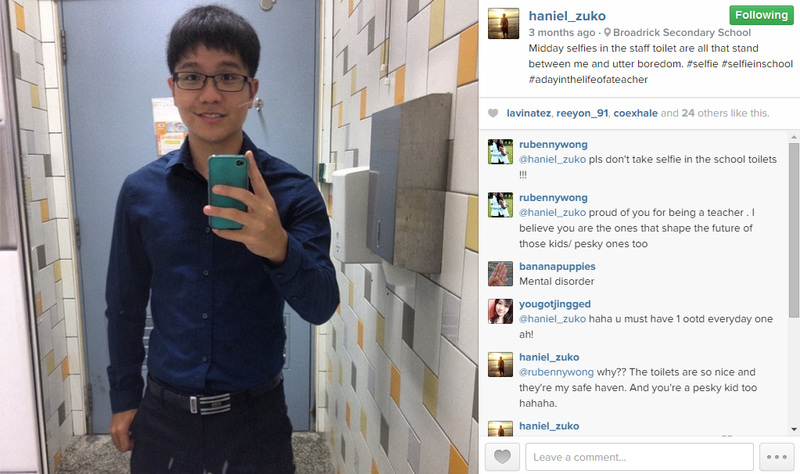 It seems like Mr. Soh also has too much free time on his hands during his professional attachment, taking not one but numerous creepy-looking selfies in the school toilet over the course of his teaching attachment. While not doing much, he proudly professes that he is looking forward to claiming more money from MOE for his perfunctory efforts. It is understood that Mr Soh is an alumnus of Serangoon Junior College and currently an undergraduate at the National University of Singapore’s Faculty of Arts and Social Science. Girl With $76,000 MOE Teaching Bond Debt-Nothing Should Have Been Awarded To Her In The First Place.